Jamal Lowe threw down the gauntlet – and a number of the Fratton faithful have been up to the challenge. The Pompey goal hero has been pounding the Southsea streets this summer to maintain his fitness. It’s a hard-running close-season regime which prompted a tongue-in-cheek social media invitation for all-comers to match his time. A fortnight ago, Lowe posted his 6k Challenge on Twitter – having covered the distance in an impressive return of 26minutes 26seconds. And the 22-year-old admits he has been surprised at the subsequent response from both friends and Pompey followers. He said: ‘I’ve got a few people running, haven’t I! ‘Originally, it was just for my mates, a little competition between us, then other people joined in and it has become a bit of a thing, a little running club. ‘It got a better response than I thought it would, quite a few people are now doing it and posting their times. ‘I think there is only one person faster than me at the moment, Elliott Johnson from Barnet. Don’t publish that, though! ‘It has been in the last two years that I’ve started running long distance, although I wouldn’t say I was great at it. ‘I only really started timing my distances this summer, before then it was a case of going for a run and that was it. Pompey’s players have spent the summer topping up their fitness ahead of tomorrow’s return to pre-season training. Tomorrow morning represents the first occasion the squad have had to meet new manager Kenny Jackett following his appointment almost a month ago. The Blues are congregating at their Hilsea training base – with an opening friendly at Salisbury taking place 48 hours later. For Lowe, it represents a maiden pre-season at the club he joined in January from non-league Hampton & Richmond, establishing himself as a crucial influence. 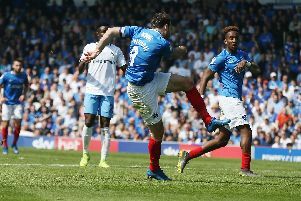 The attacker certainly hit the ground running, finishing the campaign with four goals in five matches as Pompey clinched the League Two title. Now a new challenge awaits – League One. And Lowe has already been pushing himself to the limit in preparation. He added: ‘I go running three or four times a week, you have to make it a regular thing. ‘Normally, I set off about 8am, although it depends on how early I wake up. Basically, whenever I wake up I’ll try to do it. ‘I jog along the seafront, which is a lovely view and better than running up and down the street. That route you also see a few joggers about. ‘If you sit down you get overweight – so you have to maintain that level of fitness before you go back for pre-season training. ‘In general, though, people are looking after themselves more these days, we are learning more about our bodies with sports science coming into it.